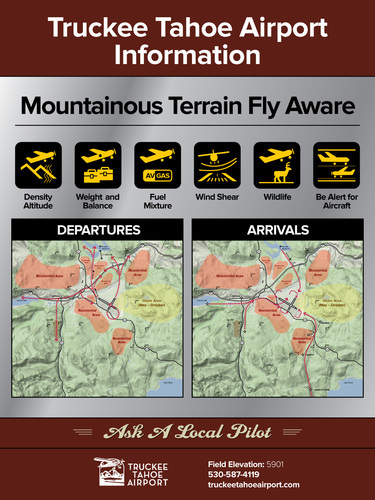 TTAD has developed an innovative pilot safety awareness program that addresses the unique challenges of a mountain airport. The program includes hosting regional safety seminars, conducting out-of-area road shows designed to educate pilots before they visit, posting signage around the airport, and hosting the "Ask a Local" program where local pilots staff the UNICOM Operations Center. If you're unsure about operations near, on or around our airport, please call UNICOM to speak with our friendly airport staff - many of whom are local pilots who can help you plan your trip safely.